11/24/2016–CHARLOTTE, NC–Thanksgiving is a time of gratitude. Gratitude for friends, family and God. It is also a day rich in traditions. Many people travel to spend time with loved ones. They enjoy a feast of turkey and all the fixins. Others spend time helping others by preparing and serving food for the homeless. Still others enjoy a day of watching football after the big meal. 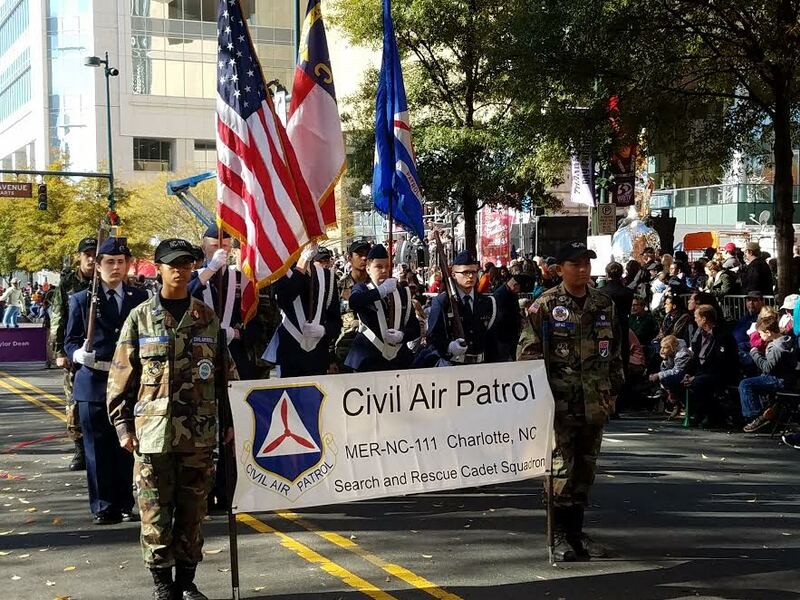 For the 111th Search and Rescue Composite Squadron, marching in the Novant Health Thanksgiving Day Parade has quickly become a tradition that all look forward to each holiday season. This past Thursday, for the 4th year in a row, the 111th marched in the parade in front of 100,000 plus spectators. The tradition began at 0700 when cadets and senior members gathered at the squadron for hot chocolate and donuts. One thing that is not a tradition is the weather. Thankfully, the sun was shining brightly this year, and there was no need to wrap up to survive the crisp, cool air. After everyone was fed and uniforms were checked, everyone headed over to the staging area on South Tryon and Stonewall streets among the floats. The sound of marching bands warming up filled the air as the giant smurf float and the enormous elf marionette found their place in line. The 111th was 40th in the lineup, in the middle of the military units. In addition to marching, they were asked to push the 4 inflatable military floats, Army, Navy, Air Force and Marines, which carried the native Chalottean singer, Taylor Dean. By 1130 everyone was headed out to their next phase of their Thanksgiving Day tradition. Starting out the Thanksgiving Day celebration together as a squadron is just one more thing many 111th members are grateful for.